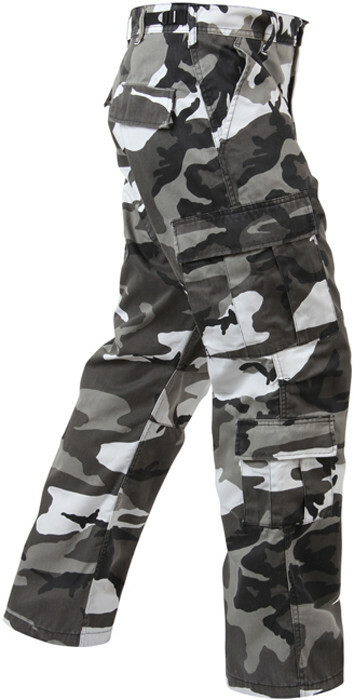 Not Just BDUs, These Are Cargo Pants With Style For The Youth Of The Nation! BDU pants are worn all over the world by different Militaries & different types of people. This Military Uniform is used for many types of activities such as during combat. This Uniform is made from polyester & cotton, but on some occasions it is made from Rip-Stop material. People wear BDU pants on camping trips, walking through woods, out fishing, & even paint balling. BDU pants are not just a pair of pants worn by Military Personnel, Law Enforcement, or Outdoor Enthusiasts. 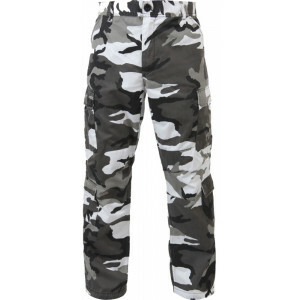 Military camouflage BDU pants are great for anyone who wants a functional, durable, comfortable pair of pants for work or play. These Fatigues are very comfortable because they have adjustable waist straps & they have drawstrings to close off the legs. BDU pants were made to fit men but they are Unisex so they maybe worn by both a women and a man. The BDU pants are part of a set which also includes the BDU shirt. You can buy both of them &have a full BDU by then the only thing you will be missing is the combat boots which we carry in all sizes. Allmeasurements are done in inches. Not all Paratrooper Pants areavailable in these sizes. All Paratrooper pants have adjustable tabsso pants can fit various waist sizes. Real waist size for pantswill be the largest size. (I.E. Size Medium will have a waist sizeof 35" and can become smaller until 31", so it will fit all thesizes in that range). These pants are mens sizes & cut for men,but are unisex.